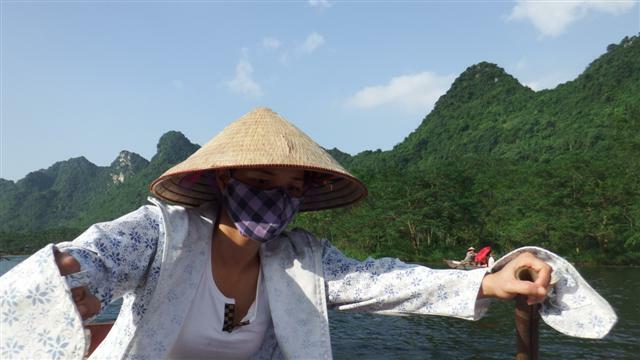 With Camomile safely tucked up in Puteri harbour for a couple of weeks we decided to visit Vietnam. 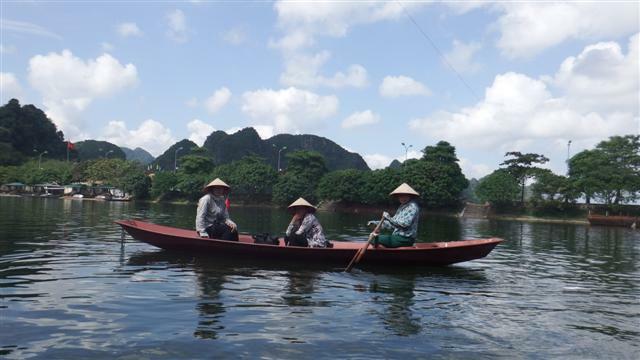 All we knew of Vietnam was from American war films and we wanted to learn the other side of the story. Oh boy did we find a different side to the story. Our journey started on 29th October with an early taxi ride to Senai airport in Johor for our flight to Kuala Lumpur where we stayed in the brand new Tune hotel on the airport grounds. Our flight to Hanoi was an even earlier start the next morning at 6.15 but fortunately that put us in Hanoi early enough to enjoy a delicious lunch across the road from our hotel in the old quarter of Hanoi. 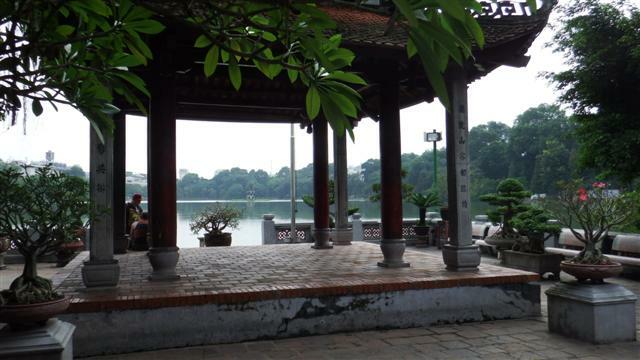 In the afternoon we embarked on a self guided walking tour starting at the Hoan Kiem lake, the epicentre of old Hanoi. 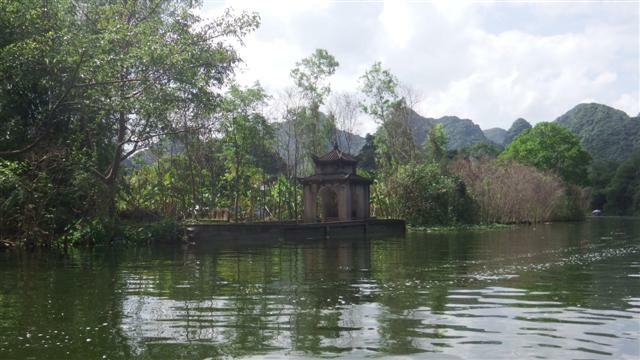 Ngoe Son Temple sits on an island in the lake serenely gazing across the water. A scarlet bridge connects the island to the shore. Trees surround the lake but beyond them the relentless traffic of Hanoi droned on. 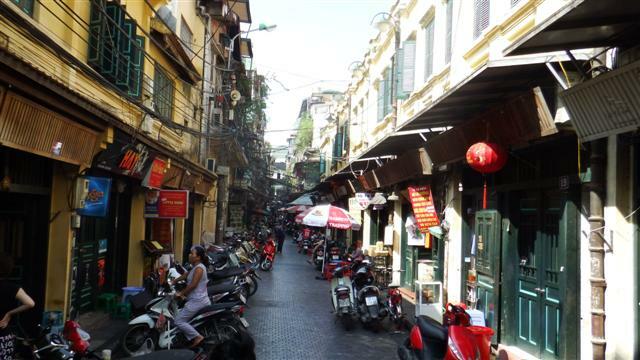 The tour took us into Hanoi’s historic heart that is the Old Quarter. It was bubbling with commerce and buzzing with motorbikes. The streets were narrow and congested and crossing the road was a nightmare but if you dared to take your eyes off the traffic when you looked up there was some elegant old architecture in among the chaos. The original name for the area 36 streets because in the 13th century Hanoi’s 36 guilds established themselves there each taking a different street. They were each names Hang, meaning merchandise, followed by the word for the product they sold. 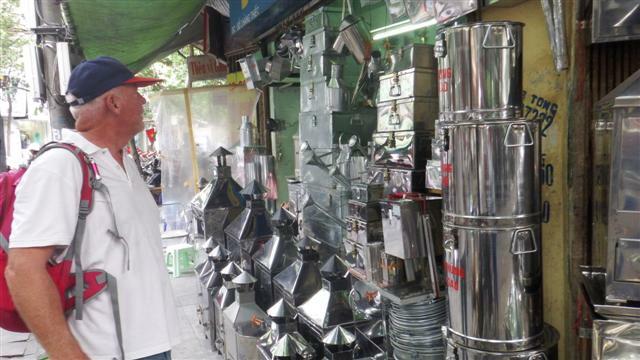 There are over 50 streets now but many of them have continued to sell the same products. 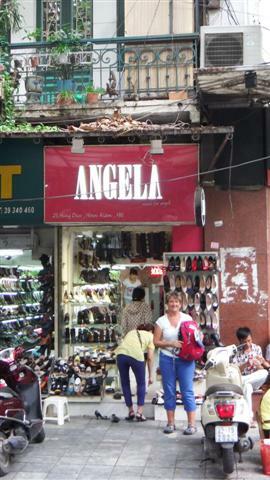 The first street we came to was Hang Dau which contained most of Hanoi’s shoe shops – how lucky was that!! Thought of my sister when I saw this shop. 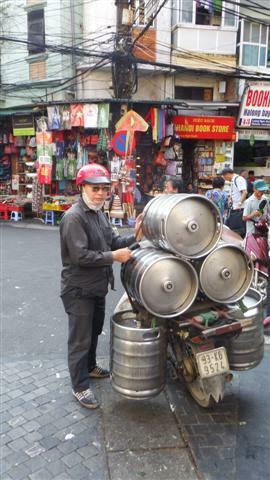 How many beer barrels can you get on a motorbike? The maze of streets was interesting but for us it was spoilt by the amount of motorbikes everywhere. Up to the early 1990s motorised transport was reported to be rare with most people using bicycles to get around but now everyone seems to have a motorbike and the city now struggles with soaring pollution levels. 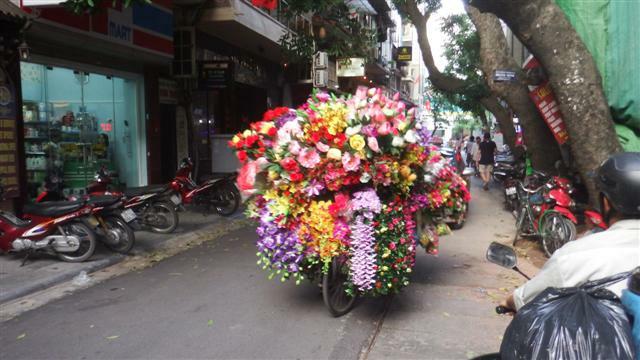 Motorbikes are used to transport everything and everyone. It was common to see Mum, Dad and 2 or 3 children all riding together, many without helmets. This man was transporting barrels of beer on his. 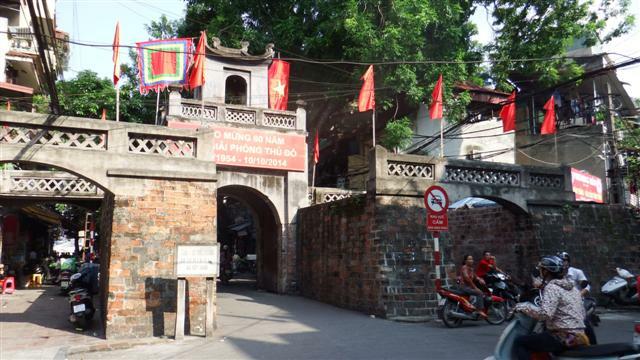 Quan Chuong the old east gate. 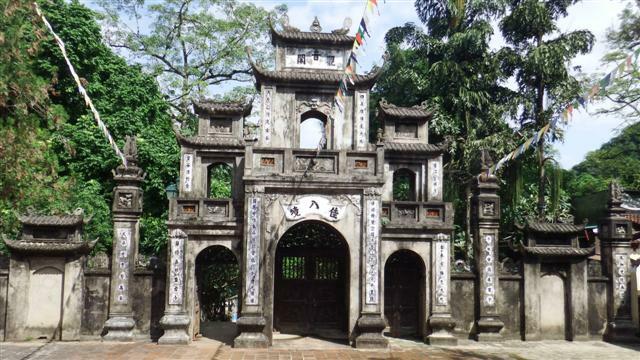 At the top of the town was the well-preserved Quan Chuong, the old east gate. It’s the only remaining gateway to the Old Quarter out of the original 36. We saw a photo of this from the 1950s and it hasn’t changed. On the other side of it was a busy motorway carrying all the traffic. Continuing north we came to the Dong Xuan market, which is the oldest market in town. Built near the end of the 19th century by the French it was almost destroyed by a major fire in 1994. Although it was rebuilt in 1996 all that remains of the original structure is the restored 1889 façade. 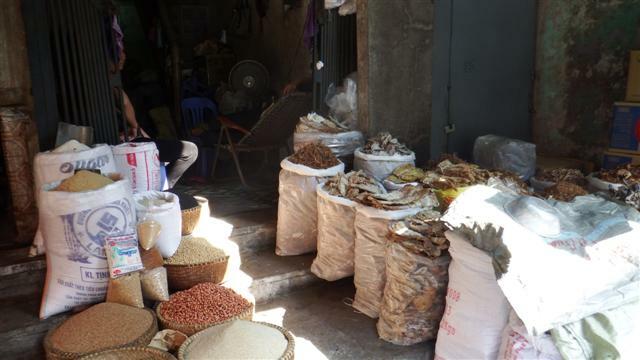 These days it’s a bustling 3 story structure packed with a wide range of goods ranging from these sacks of dried fish (good job they haven’t invented ‘smelly’ websites yet) ….. Heading south again we entered the Bach Ma temple said to be the oldest temple in the city with much of the current structure dating back to the 18th century. 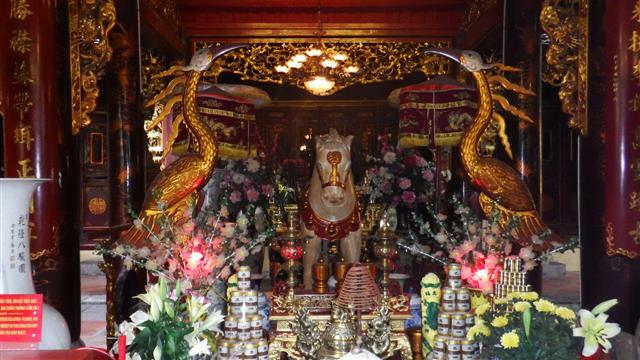 Emperor Ly Thai To built the original temple in the 11th century to honour a white horse that guided him to the site where he decided to construct his city walls that became Hanoi. There’s a beautiful statue of the legendary white horse inside. On the way back to the hotel we walked down Hang Thiec (tin) where Bill found a shop selling tin boxes. Fortunately there was no way to get them back to the boat otherwise he would have bought some. 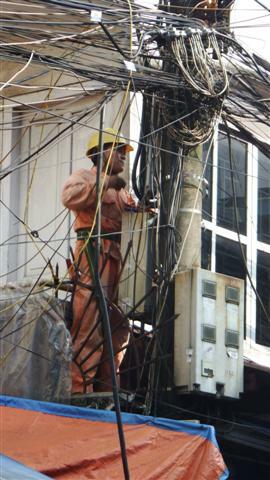 Having been built before electricity the whole area is covered with thick power lines (as are many of the streets in other Asian cities) this guy looks like he’s come to fix them. Don’t think I would want his job! 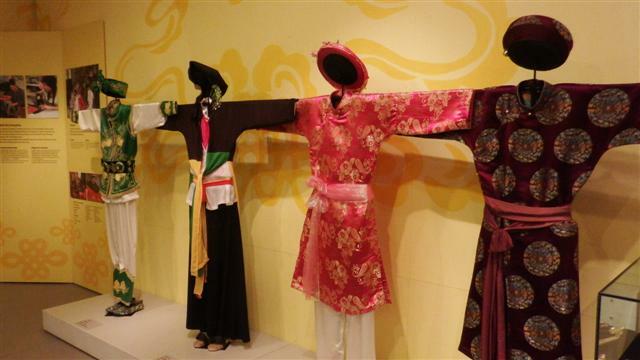 Our second day in Hanoi was to be a museum day. 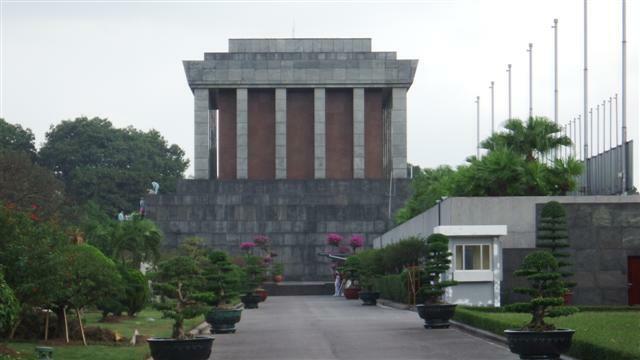 We set off down Hang Gai (silk) and then walked up the grand Dien Bien Phu towards the Ho Chi Minh mausoleum complex. 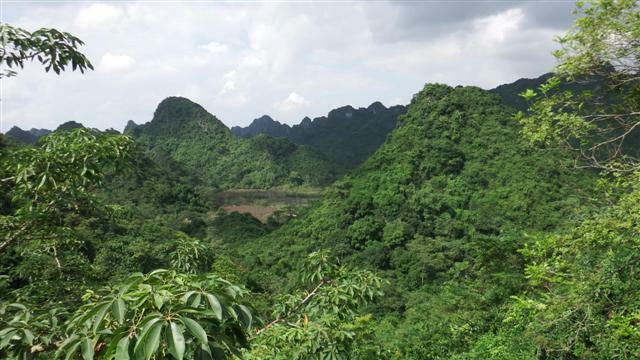 Ho Chi Minh had shunned the trappings of power during his life and had specifically requested that he be cremated and his ashes scattered in Northern, Central and Southern Vietnam symbolising the national unity he had devoted his life to. Unfortunately after his death in 1969 his final testament was altered and the great leader was embalmed and installed at the Ho Chi Minh Mausoleaum. Sadly for us Ho Chi Minh’s body had gone to Russia for it’s annual re-embalming and this photo was taken as close as we could get to the building. The grey structure, built of stone quarried from Marble mountain, was intended by the architects to represent a lotus flower; a bit of imagination needed there. We looked around the museum but it was a bit of an eclectic mix of memorabilia and photos from his youth without saying very much. 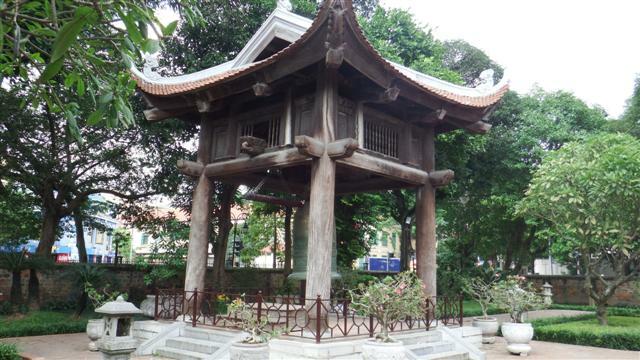 In the grounds of the Mausoleum are Ho Chi Minh’s stilt house, where he is said to have lived in favour of the presidential palace (but it was closed), and the One Pillar Pagoda, which was being renovated but at least they were letting people in to take a photo of it. So we came away a bit disappointed. 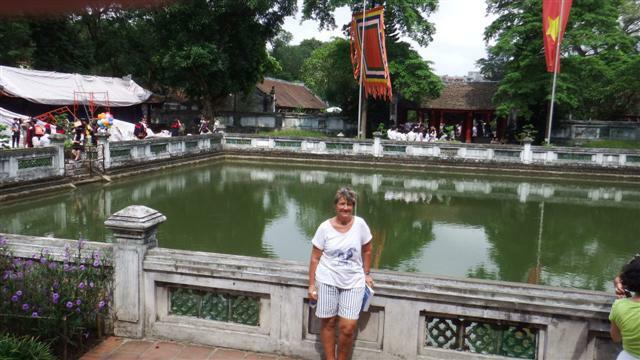 Our next stop was the Temple of Literature, the oldest and possibly the finest architectural complex in Hanoi. 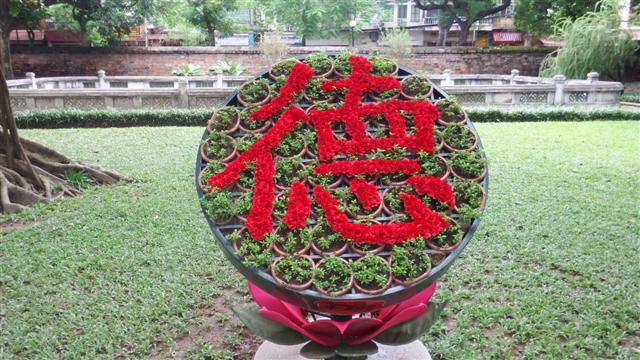 It dates back to 1070 and was founded in honour of the Chinese philosopher Confucius. It consists of 5 courtyards each separated by walls and ornamental gateways. A central pathway through the middle divides it into two symmetrical halves. The guidebook says ‘it’s a spiritual retreat from the busy streets’. Again we were unlucky because the day we visited it was packed with students and their parents from the local university for their graduation ceremony. It was wonderful to see them all happy and pleased with themselves but their shouting and squeals of delight didn’t do much for the ambiance of Confucius. 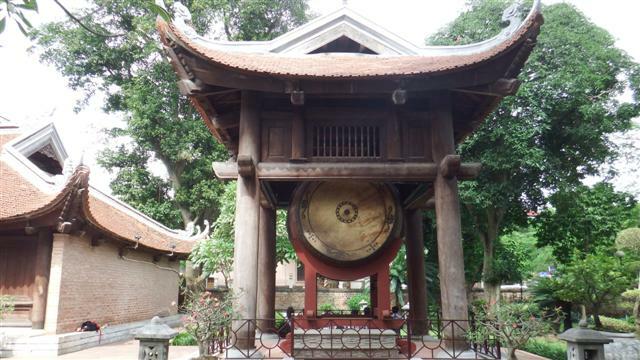 This is Thien Quang Tinh or Well of Heavenly Clarity, which dominates the third courtyard. The buildings on either side house 82 stone stelae, the most prized relics of the temple. Managed to get a photo without too many students in it. These beautiful young ladies are wearing ao dai, the traditional Vietnamese dress. These two magnificent towers were added either side of the fifth courtyard during a recent renovation. To the west is a splendid bell tower and to the east is an impressive giant drum. They have been built in symmetry, as is the tradition. We moved on to the Military History Museum but because it was Friday it was closed! We weren’t having much luck. We sat and had a coffee outside so we get get a view of the iconic hexagonal flag tower, which was rebuilt in 1803. the view from the top is reported to be one of the best in the city but not for us. 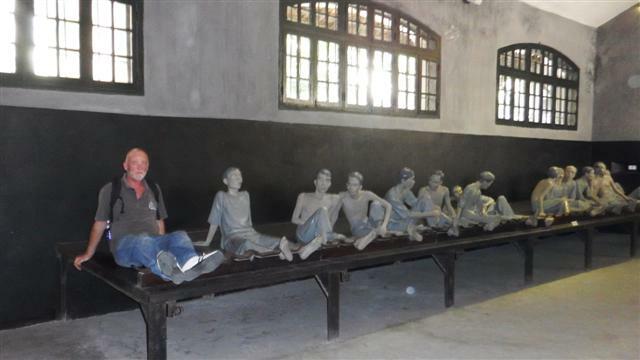 After lunch we walked to the Hoa Lo prison, which is now a museum and it was open – hooray. 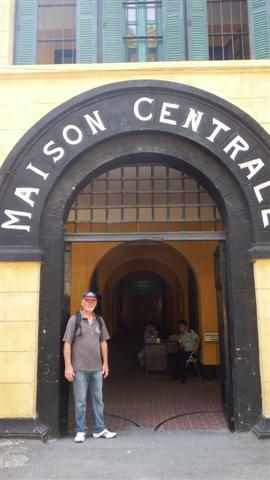 Built by the French in 1896 to hold around 450 prisoners but by the 1930s there were over 2000 detainees. It was also used to house downed US pilots during the war. 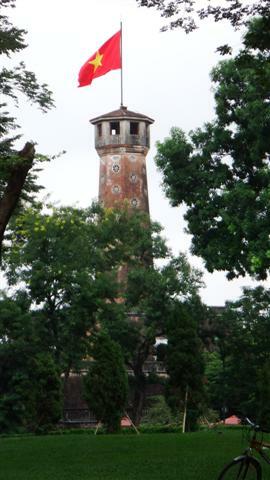 Most of the original buildings have been demolished to make way for the Hanoi Central Tower buildings but enough of the old prison has been preserved to create the museum. There was a scary array of whips and other instruments of torture and the living conditions must have been horrendous. In contrast the section devoted to the American POW showed how well they were treated by the Vietnamese during their stay. Possibly propaganda but the photos showed unmarked well-fed Americans in contrast to the pictures of the ill-treated, under weight, Vietnamese at the hands of the French. The Vietnamese Woman’s museum was a bit further down the road so we had a wander around that. It was very well laid out with lots of informative slides. There was a section of the wartime contribution by individual heroic woman that was fascinating. 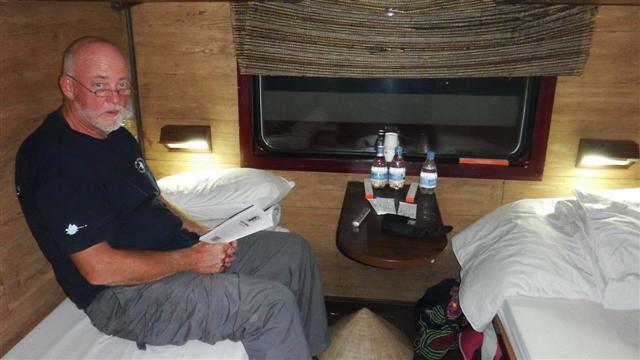 Despite Bill’s initial resistance it turned out to be an interesting visit. On the walk back to the hotel I spotted this lady cycling down the street with a fairly big load! 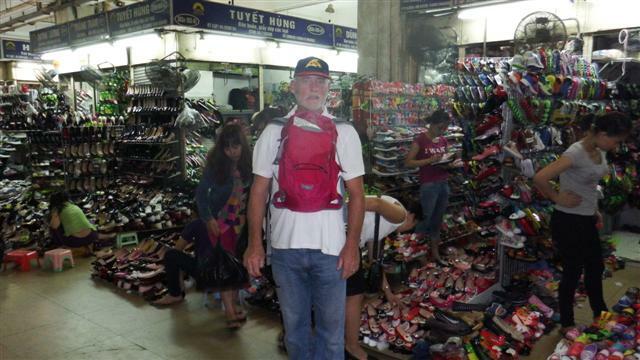 Having had a mixed day we decided to visit the night market before going to see the famous water puppet show – big mistake. 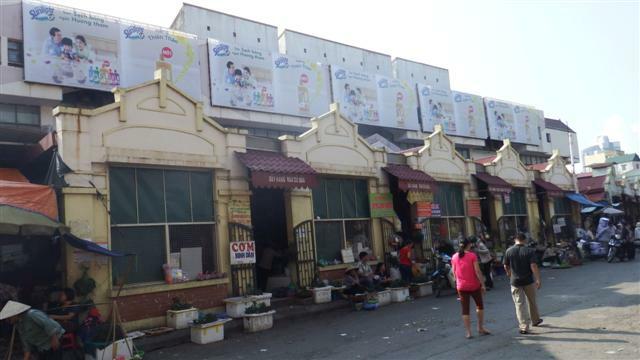 The market runs the length of Hang Duong and Hang Ngang; we were told the streets were shut until midnight. Firstly the streets were shut but the b*****y motorbikes were still weaving their way through the crowd so you had to constantly watch your backs, secondly there was no chance of looking at any of the goods because the stallholders pounced on you as soon as you stopped to look at anything. At the top end there were lots of street stalls selling food where we ordered noodle soup expecting a simple bowl of soup as we’ve had in the past. What we got was a stewpot sitting on a mini stove with an array of baskets containing veggies, various meats, fish and shellfish on a plate to add to the stock, and noodles. The lady kept coming back and adding more food despite our protests! It was lovely food but there was enough to feed half a dozen people and it cost the same as the three-course meal we had in the restaurant the night before. To top it all we missed the water puppets; I was not amused. 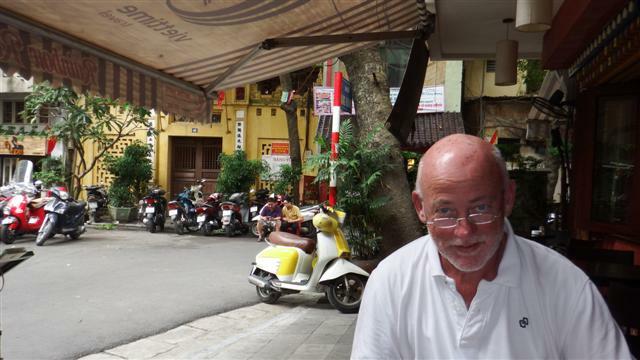 We hadn’t fallen in love with Hanoi as many others had. 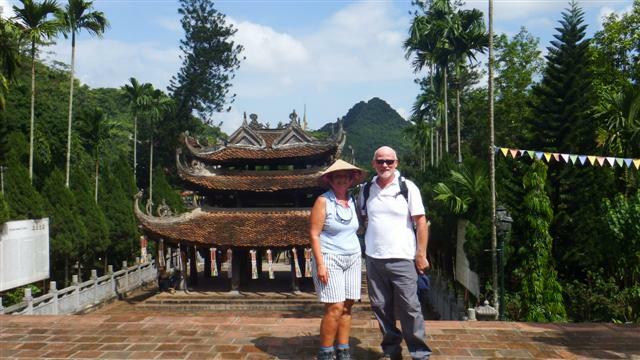 Having had enough of the continuous traffic we decided to spend our third day in Hanoi out of the city and booked a tour to the Perfumed Pagoda. 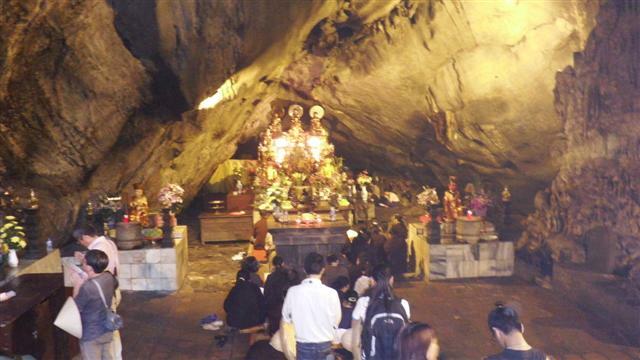 The complex actually consists of around 30 Buddhist shines but we only managed to see two of them. The day started with a bus ride to My Duc, a township on the Suoi Yen river where everyone was loaded into metal rowboats for the hour’s journey up the river. 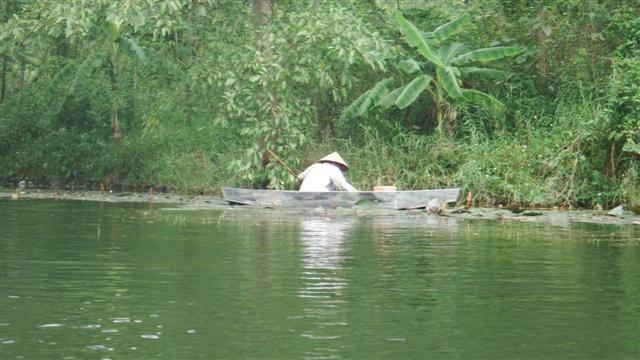 Traditionally women row these boats. The lady who rowed us was tiny but she managed to row our group of 6 for the next hour and a half through wonderful scenery passing little shines along the way. 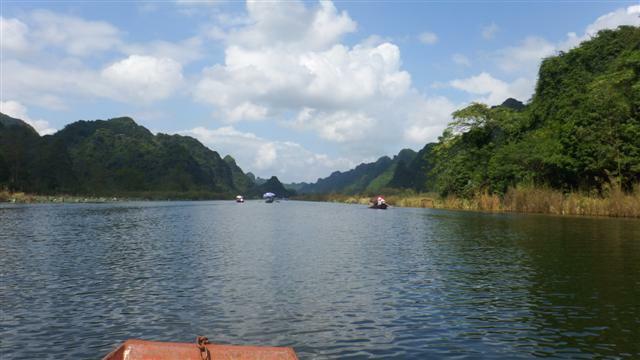 The scenery was magical as a dozen boats or so glided through the limestone cliffs; this is what we imagined Vietnam would be like. At the end of the river the tour continued on foot for about half an hour until we arrived at Thien Tru Pagoda also known as the Heavenly Kitchen Pagoda. The 18th century shine rises through three levels on the mountainside. 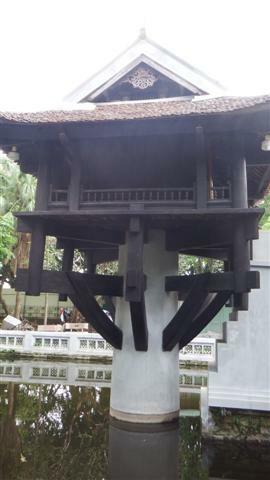 An elegant triple-roofed bell pavilion stands in front of the temple. The main altar inside looked stunning against the backdrop of green forest behind it. 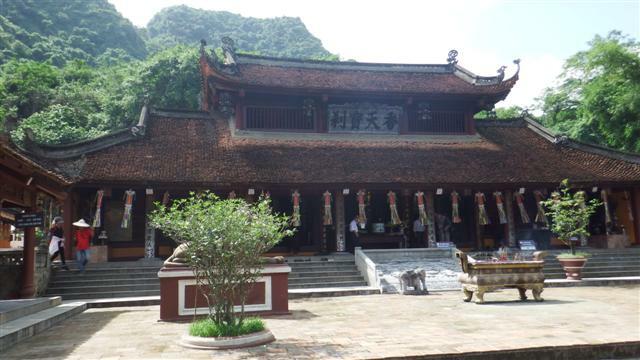 A bit further on everyone got into gondolas that whisk you the last couple of kilometres up across the jungle to Huong Tich Chu otherwise known as the Perfumed Pagoda. 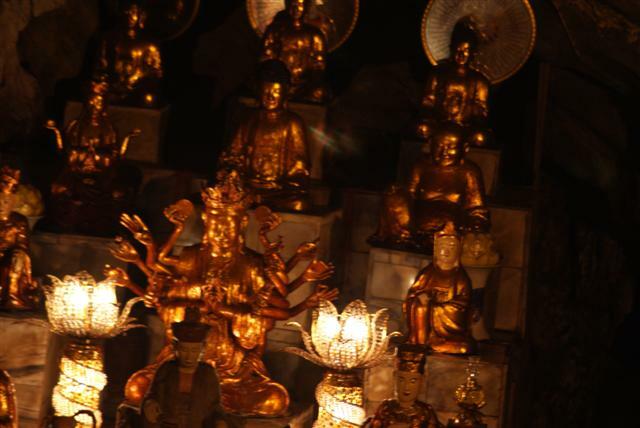 120 steps lead down into the deep cavern filled with incense smoke and gilded figurines of the Buddha and Quan Am, goddess of Mercy. It was an amazing place. We opted to walk the 3kms back down to the river instead of taking the gondola. Sadly this was the view for the entire length of the walk. 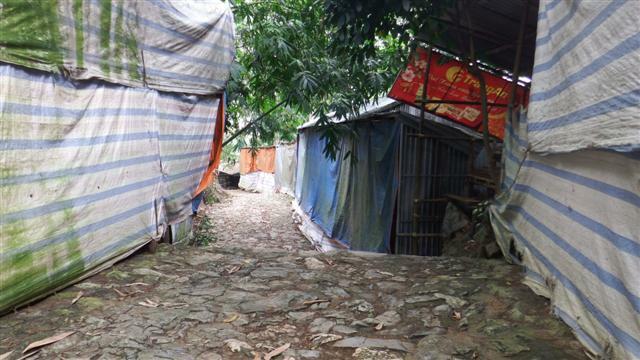 Most of the stalls were closed and covered up, such a shame the Vietnamese have spoilt an otherwise lovely walk. 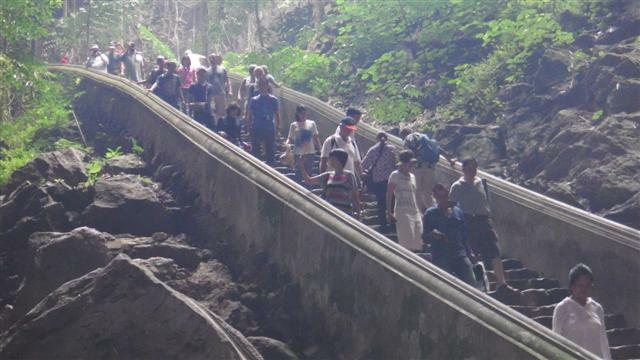 Once down by the river we were rowed back to the village and bused back to the city where we boarded the night train to Lao Cai, gateway to the hilltribes of north Vietnam. 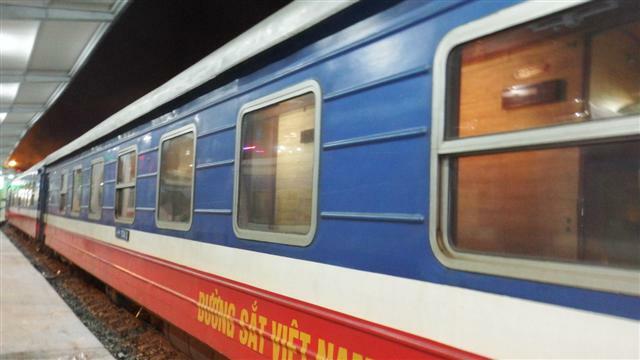 Posted on November 30, 2014, in Port posts and tagged Hanoi. Bookmark the permalink. Leave a comment.